BURLINGTON, N.C. – Songwriter, singer and producer Sawyer Frye, aka Koopa Fields, made national headlines on June 26 when Folgers Coffee announced that Frye’s video submission “The Americana jingle” had won the 2013 Folgers Coffee Jingle Contest and a $25,000 prize. Frye, who composed and performed NAA’s “Key To Tomorrow” theme song at National Convention in Raleigh, N.C. earlier this year, is currently working on a special project for The Alliance. Frye came up with the idea for his jingle one late night with his musical partners Zach and Marcus Cox. In the video announcement from Folgers, which can be seen HERE, Frye sings, plays guitar and taps a tambourine, Zach Cox plays dulcimer and Marcus Cox plays the djembe and percussion instruments. As required by Folgers, Frye’s submission included the famous Folgers jingle, “The best part of wakin’ up is Folgers in your cup.” Frye’s winning submission could be seen in a national ad campaign later this year. Frye’s video was chosen from thousands of submissions in the contest. For six weeks, Frye and the Cox brothers watched as their video ranked in the Top 10. Their eventual win was a result of fan votes and the decision of a panel of judges weighing in on creativity and originality, musical performance and adherence to contest guidelines. Voting ended on June 19. 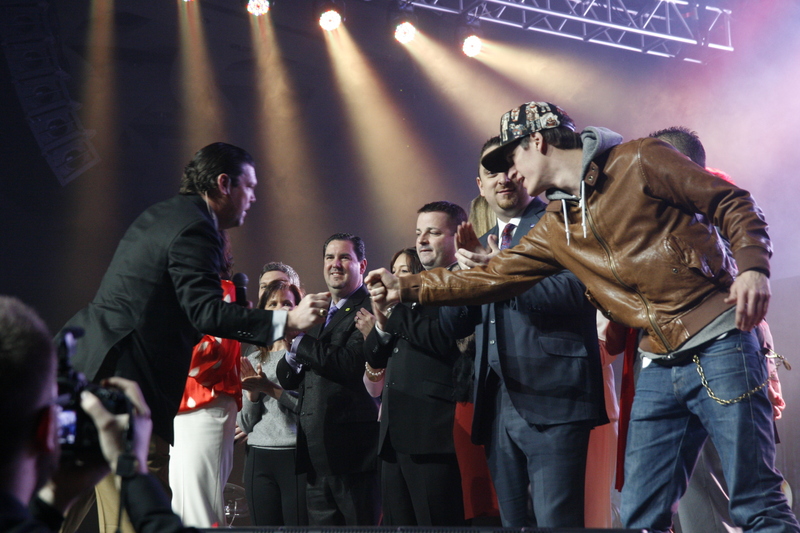 The final announcement was made via a video featuring multi-platinum recording artist and Folgers spokesman Gavin DeGraw, who congratulated Frye on his win. Other finalists included a group of men in striped pajamas shaking coffee grinds instead of tambourines, a split screen of women scatting, a samba-based jingle and a gospel-style quartet. Many of the submissions were shot with webcams or lower quality cameras. Frye’s, however, was made with a higher quality camera on a farm near Kernersville, N.C.
Frye, who lives in Winston-Salem, N.C., plans to use the $25,000 prize to purchase better music and recording equipment. He also plans to release an album in the fall with the band Arm the Pioneer, a band consisting of Frye, Marcus Cox and David Cavanaugh. This is not Frye’s first major contest win. In 2010, he won the McDonald’s “Legends of McRib” contest. He has also produced commercials for Firehouse Subs, Mellow Mushroom, Simpli Oatshake and The Incredible Edible Egg. He won four national jingle contests last year, filmed music videos under the name Wayfare Creative and is videographer for his business Sweet Tea Weddings. To learn more about Frye’s career, you can find Frye on Facebook, YouTube and twitter at sawyerfyre.com and koopafields.com.